This page was last updated on July 10, 2004. 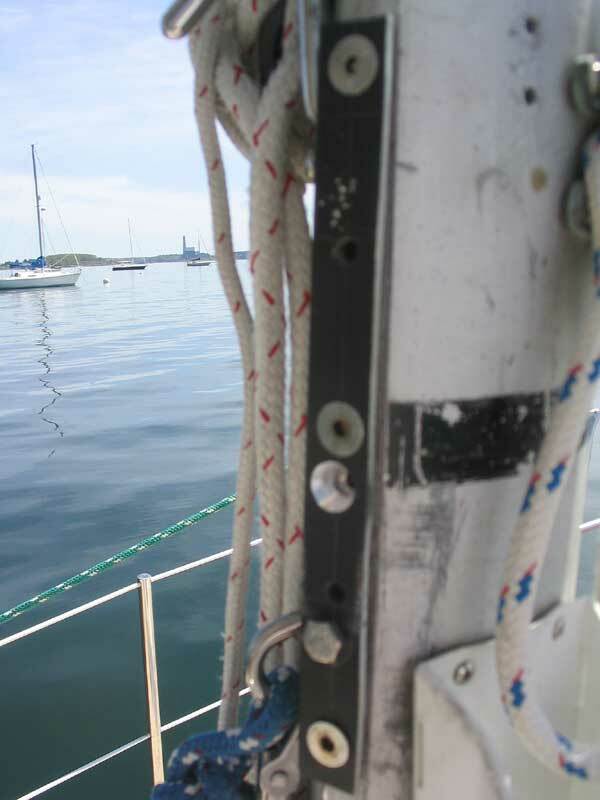 My original mast was equipped with a sliding gooseneck. This consisted of a slim aluminum T-track bolted to the aft side of the mast with several stainless steel screws, and was designed to accept a bronze car attached to the end of the boom. 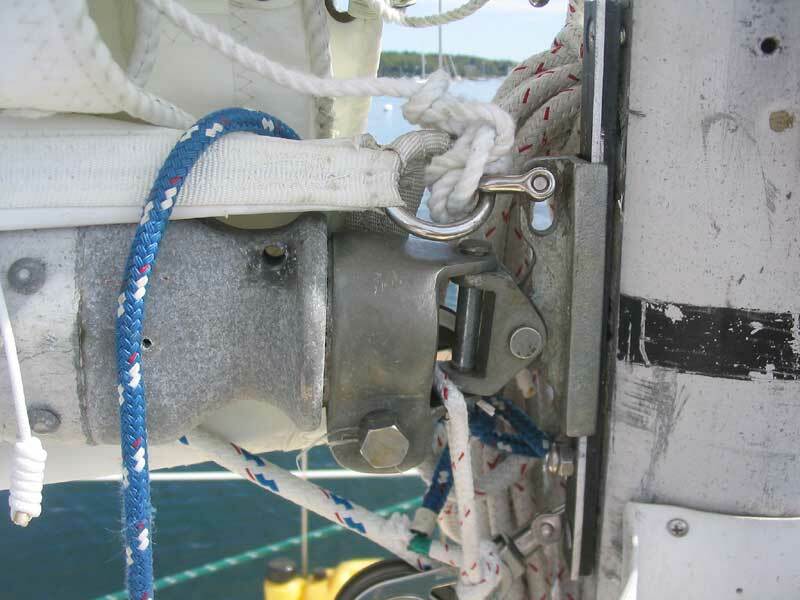 With a sliding gooseneck, the boom could be pulled down to help tension the mainsail luff--a workable, but antiquated, system. When I bought the boat in 1999, the hardware was already 37 years old. Looking back, I'm sure the original setup was destined for failure under my watch. Why? 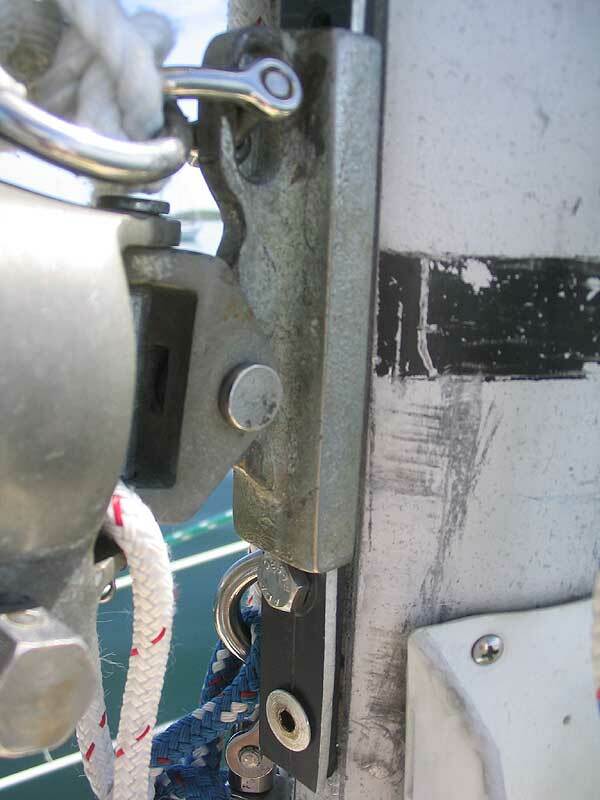 Well, one important rigging upgrade I made immediately upon launch in 2001, following my complete restoration of the boat, was to install a spring-loaded rigid boom vang from Garhauer Marine. Installing the boom vang, by nature, required fixing the gooseneck in place to prevent sliding. With a stop bolt and some line, I secured the boom so that it couldn't slide up or down, or at least not much. 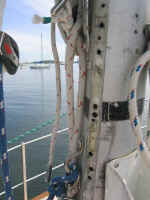 It worked well enough, and I postponed any thoughts of locating a new, fixed gooseneck fitting for the mast, though I had the thought at the time. There was so much going on at the time, shortly after my initial launch, and I was focused on trial sailing, so any further attention to the gooseneck went by the wayside. 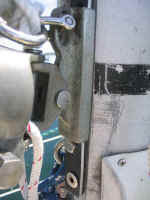 Early in the 2002 season, the original aluminum gooseneck track failed, breaking right at one of the screw locations. 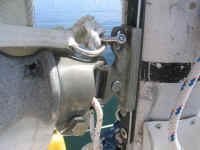 The breakage was caused by several factors, including age and weakness caused by corrosion between the track and the stainless steel screws securing it to the mast. The new vang also had increased the pressure on the fitting, as in pulling down the boom, the vang also tended (they all do) to pull the boom itself forward, into the track. Particularly off the wind, this caused side loading to the track, and all of this was simply too much for the tired materials. 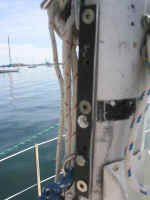 I temporarily repaired the track at the time by removing an extra section of the track from the mast and installing it in place of the broken section with new screws that I tapped into the mast. However, it was clear that the old aluminum track had simply run its course, for a few weeks later, during the first day of a 2-month cruise, the gooseneck failed once more, breaking the track again. We survived with the gooseneck lashed to the mast for a week or two before I had a chance to address a more permanent repair. The materials I had on board included some new 1" aluminum T-track, which I had tried using earlier for the repair, but found that the old bronze car on the boom required a 7/8" track section. However, now it was time to make do, so with a hacksaw I carefully removed 1/8" of the track in a longitudinal direction, which allowed the car to fit well. 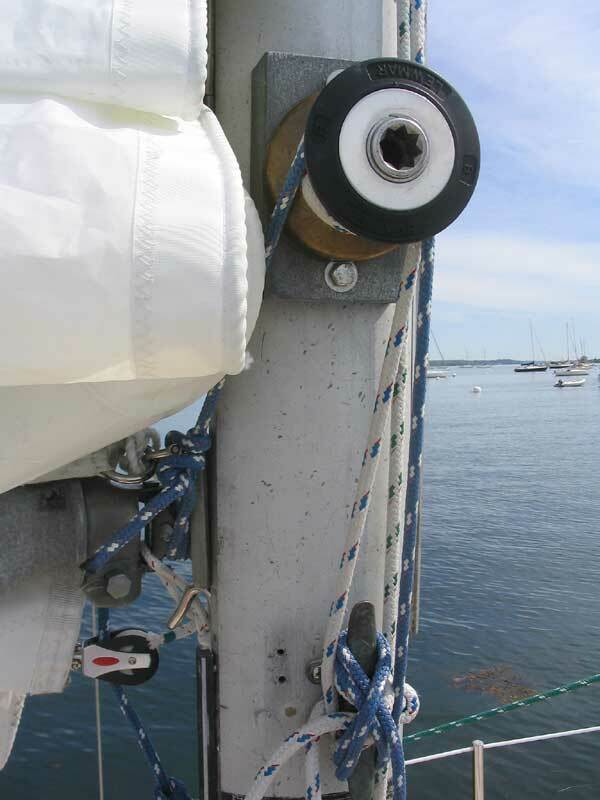 Then, I secured the new track to the mast with new fasteners tapped into 1/4-20 holes. The new arrangement seemed very secure, and served well for the remainder of the cruise, and in fact through the remainder of the 2002 season and all of 2003. It worked so well, seemingly, that I put its replacement at the bottom of a large, and ever-present, list of boat projects, upgrades, and maintenance. The 2004 season began uneventfully, but on a day in early June, I noticed--while working on a nearby project--that the once-successful gooseneck repair had begun to fail again. The entire track was pulling slightly away from the mast, leaving a gap of about 1/8". The forces from a hairy gybe a day or two earlier may have caused the issue, or maybe not; I wasn't sure. In any event, the screws seemed to have lost their grip on the spar. Abandoning the other project I was working on, I addressed the track by tightening the screws--they seemed to hold OK--and installing one new screw directly behind the boom car location. This seemed to hold, but after sailing that day I noticed that the track had once more pulled away. Obviously, more drastic measures were going to be necessary. 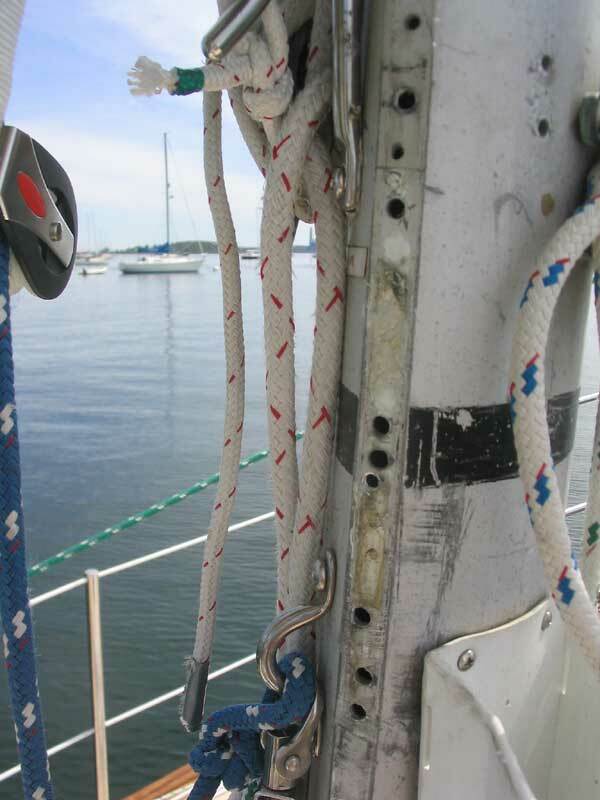 It was time to track down and install a real mast gooseneck fitting--one that was fixed in place and up to the challenges imposed by the boom and boom vang pressures. In the meantime, however, I needed another "temporary" fix so that I could keep sailing while tracking down a new mast fitting. The mast already looked like Swiss cheese behind the track, with myriad holes from the old track, the first attempt at repair, and the more successful later repair. 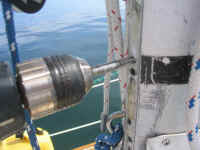 I didn't relish drilling even more holes in the spar. By nature, the boom-end fitting and arrangement forces awkward pressures on the track system when the boom is let out while sailing downwind. As the boom is swung out, the pressure changes from a direct fore and aft force to one that pushes or pulls in a more sideways direction--a direction that these sorts of tracks and fasteners are not designed to support. The problem is exacerbated--perhaps dooming the arrangement to failure--by the installation of a solid boom vang, which puts higher pressures on the fittings than the original setup might have. Tensioning the vang not only pulls the boom down; it also pulls the boom towards the mast. 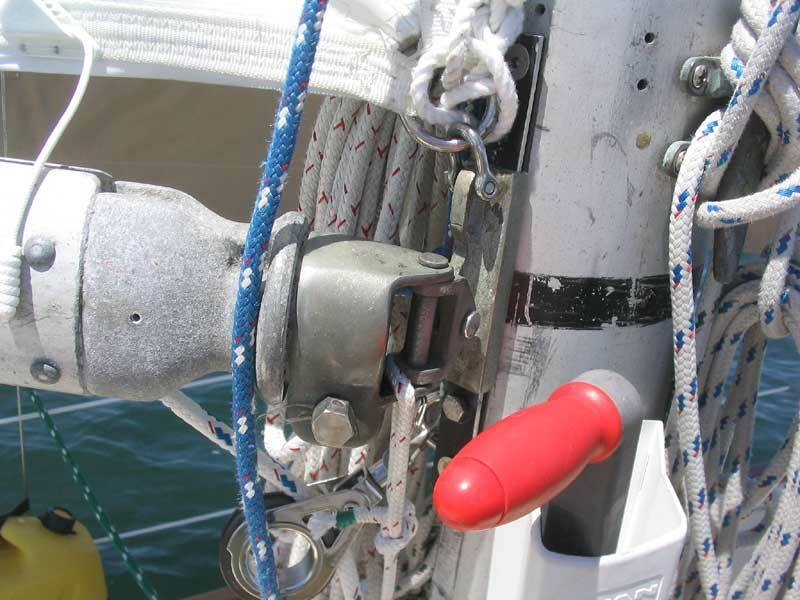 With the boom let out (and the time when the vang is most important), this translates to increased sideways pressure on the track and track fasteners on the mast. Did this cause the failure of the threads in the mast? 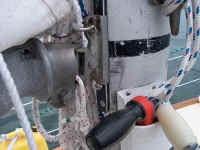 Was it one-time shock loads from a difficult gybe? 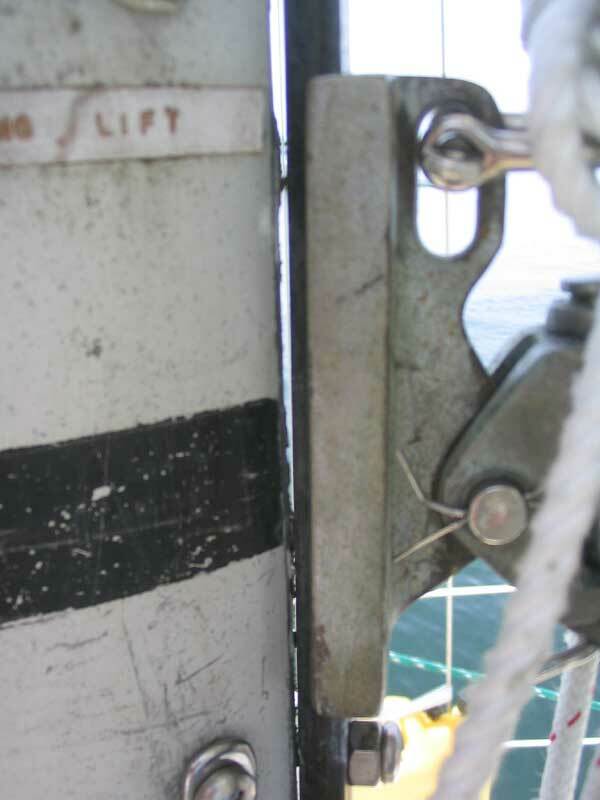 Is the aluminum mast simply losing its strength after more than 40 years of service? Or was it a combination of all these factors? Instead, I decided the best course of action would be to replace the 1/4-20 fasteners with the next size up. I hoped that retapping the threaded holes in the mast with a larger size would allow the new fasteners to grip sound material and hold, without forcing the need for additional holes in the mast. At the hardware store, I found that the only 5/16" stainless steel flathead fasteners they had featured a hex drive (Allen wrench), but that was fine. The flat heads were important, since the track car needed the clearance to pass over their tops. 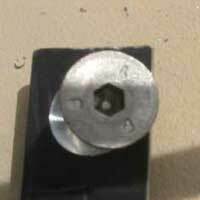 I purchased a number these fasteners, as well as a single 5/16-24 hex head bolt, which I planned to use beneath the boom slide to prevent it from falling too low; previously, I had used a pan head screw with a larger bolt behind the head to hold it out further and therefore hold the slide in place, but I could find no such fasteners in the larger size, so I chose the hex bolt. The flathead fasteners I picked up had a coarse, thread (5/16-18), so I made a mental note to be careful when tapping the holes later and ensure that I used the proper tap in the proper hole. Out at the boat, I began by lifting the boom off the track and securing it out of the way to provide clear access to the area. I held it up with a line wrapped over the main halyard winch, and pulled the car over to one side with another line to hold it securely. With the boom out of the way, I removed the track and old fasteners, and marveled at the horrible appearance of the mast beneath, peppered with holes. Oh well: most of the holes had been there since the mast was first built, and the rest had been there for two years. I checked the area carefully for more serious signs of stress, however; I saw no evidence of cracking or other signs of more major trauma, and proceeded as planned by tapping three of the four holes for the track with a 5/16-18 tap, and the final hole--carefully marked by me--with the finer 5/16-24 tap for the hex head bolt. I hoped that the new threads would hold in stronger material; the old threads had failed in the mast material, leaving bits of aluminum in the fasteners that I removed. Apparently, the force had simply sheared the threads, pulling them right of the mast. I became a little wary of the overall strength of the mast aluminum, but pressed onwards for now. I reamed out the 1/4" holes in the track with a 5/16" bit to accept the new fasteners, and increased the size of the countersinks for the larger heads. I was happy to be dealing with aluminum, which milled easily. I tapped the entire length of the hole where the boom-supporting hex head bolt would go, however, to give the threads increased biting area. Then, I reinstalled the track, tightening all fasteners securely. With that, the repair project was complete for the moment. A light air sail shortly thereafter caused no concern about the gooseneck, but served as a decent trial nonetheless. All this happened on a weekend, but I planned to begin a serious search for a mast gooseneck fitting to accept my boom end as soon as the workweek began. No resting on my laurels this time: it was time, once and for all, to replace this tried-and-true, but seriously weakened and completely unacceptable, arrangement. We recommend viewing this site with your screen resolution set to 1024 x 768 or larger. Problems? Email the webmaster. ©1999-2014 by Timothy C. Lackey. All rights reserved. No duplication of any portion of this website allowed without express permission. Permission may be obtained by emailing the webmaster.